This film, in contrast to the less overtly propagandistic Hong Kil Dong, exhibits the full-on expression of the Juche (self-reliance) ideology that all North Korean films are meant to illustrate. However, the thwarted love story at its center is the melodramatic sugar that makes the ideological medicine go down. 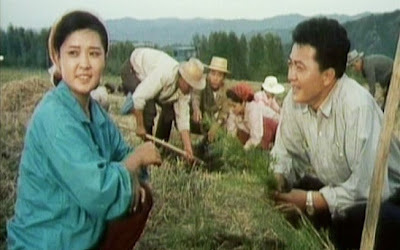 The film begins with a man, Won Bong, who takes his son, Se Ryong, to the village he used to live. He is now an exile due to his failed love affair with Song Rim (O Mi-ran), or “Bellflower,” nicknamed as such after her favorite flower. She is the idealized, hard-working comrade, whose every thought and action is devoted to modernizing her village and her farm collective. Wu Bong wishes to marry her, but her sister Song Hwa is violently opposed, as they have been orphaned because of the Korean War, and she is afraid of being left alone. Wu Bong is offered a job in the city, and wants Song Rim to accompany him. He wants to make his fortune there, and thinks it will take their village a century to catch up technologically to the city. She refuses to go with him, and throws herself into improving the village. Wu Bong, having failed in the city, and now living in painful regret of his lack of faith in the power of the village people, sends his son to ask for forgiveness on his behalf. He ends the film crying, clutching the dirt, asking forgiveness from the village he abandoned, and the now deceased Song Rim, who sacrificed her life for the village. Bellflower resembles both Chinese Maoist propaganda films, with the frequent paeans in song given to the virtuousness of their work, and South Korean tear-jerker melodramas. As the latter, it seems to be quite effective, as evidenced by the tears streaming down the face of the woman who sat next to me at the screening. O Mi-ran, dubbed “the People’s Actress,” more than fulfills this role, as the pure, virtuous comrade, so selfless and devoted to her people. The characterizations are tissue paper-thin, but this is in service to its true aim, as all the characters are types to illustrate the message of the folly of putting personal gain over the collective good. Released in the midst of the catastrophic famine that struck North Korea in the mid 90’s, My Look in the Distant Future, as indicated by its title, exhorts its viewers to look past the then current troubles to the bright, shining future that is possible if all citizens put their nose to the grindstone and work, work, work selflessly for the good of the nation. Once again, as in Bellflower, a melodramatic love story, the bulk of which is told in flashback, forms the spine of this story. But here, the ideological content is in overdrive, with frequent songs attesting to the goodness of the paternal Great Leader, and the glory of the country and its people. Lessons for proper citizen behavior are illustrated by the story of dissolute, spoiled slacker Jun (Kim Myong-mun), whose father was a great hero, and who is content to live in the reflected glory of his parents’ accomplishments, causing his parents no end of embarrassment and grief, especially his father, who holds his son responsible for half the gray hairs on his head. One rainy night, Jun gives a ride to Su Yang (Kim Hye-gyong), a young woman with whom he becomes instantly smitten. He later learns she is the group leader of a construction brigade, and tries to use his influence to get her into school to train for a more prestigious position. Su Yang turns this down to work on a farm, and Jun follows her to work on the farm during his vacation time. He wishes to take her back to Pyongyang to marry her, but his plans are thwarted when she rejects him for not having a pure heart, and not being a son worthy of his parents, especially his grandfather, a war hero during the resistance to Japanese rule. Thereafter begins a painful maturing process, where Jun learns the error of his ways, and achieves the great accomplishment of finding an alternative to oil for the farm’s tractor. The message is clear: the individual is nothing, worse than nothing, actually pernicious, and the collective is all.